We absolutely love our roles as Marriage Celebrants. We enjoy meeting couples and hearing how they met, their plans for their marriage and their hopes for the future. We believe in Marriage and believe it’s a commitment for life, to have someone that’s your best friend, your soul mate, someone to trust and who will always be there for you is an amazing feeling. 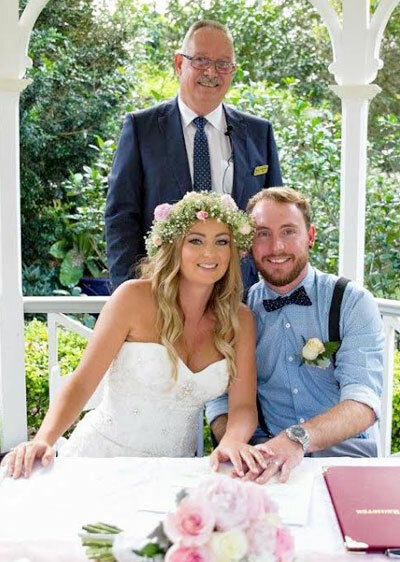 We’ve been married for over 35 years, have two fantastic children and yes, we were married by a Marriage Celebrant on the beautiful Sunshine Coast. We perform ceremonies in Brisbane and south to Byron Bay. It is our mission as marriage celebrants to conduct a wedding ceremony that uniquely reflects your love story. We strive to ensure that your wedding ceremony sets the tone not only for your wedding day, but also for your marriage. We will assist you in creating your special ceremony marked by your beliefs and vows. We follow your wishes in setting the tone of the ceremony – formal or informal, spiritual or secular, serious or light-hearted but always focusing on the intent of marriage ceremonies, to join a couple together in love, trust, fidelity, and hope for a wonderful life together. In our professional careers we have both come from a back ground of project management, sales, training and client relationship management. We are confident public speakers who enjoy engaging with people from all walks of life. We are registered with the Attorney Generals Department and we are also members of the Australian Federation of Civil Celebrants. This ensures successful fulfilment of our roles and that we remain up to date with the legal obligations of being marriage celebrants.